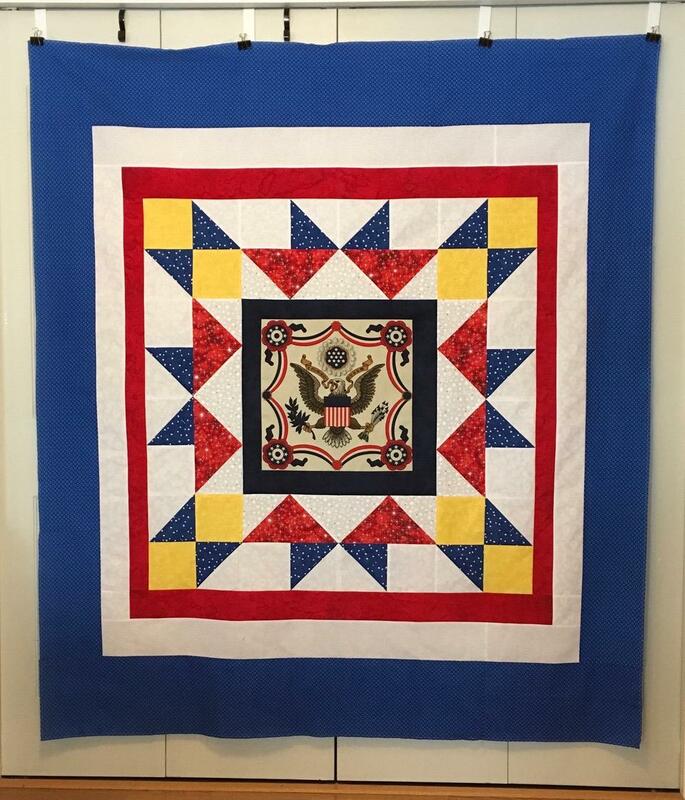 Because I prepared kits for two Quilts of Valor on the national QOV Sew Day, all I needed to do was sit and sew. Morning Star was made with another medallion pattern from Evelyn Sloppy's book Sew One and You're Done book: Springtime, pages 46-49. The eagle in the center is one of the eagle napkins I purchased at a silent auction last winter. My goal for February is to make QOV from all of the eagle napkins. Morning Star is the third quilt made this month. I have four more eagle napkins to use. Spectacular! It looks like fireworks. Really pretty! You are on a roll with these! They just keep getting better and better! I really like this layout. Great job! Nice! Nancy would you ever make one with all four napkins in it. Like in each corner or something? I can't believe how fast you make these! As I said before, I really like the yellow. It just pops. You're making me want to see a copy of Evelyn's book! How gratifying to whip these off the assembly line! Yippee!